Extra cushion for those with tender knees, wrists, hips, or spine, 5/16 inch thick. Also, excellent for Pilates and core fitness practice. 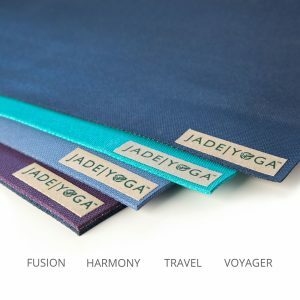 The natural choice is the Fusion yoga mat from JadeYoga. 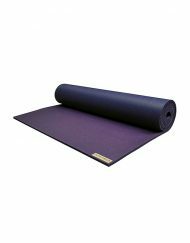 Fusion brings together natural rubber from the Far East, one of earth’s most amazing natural resources and Western technology to form a mat that is perfect for your yoga practice. In addition to providing better slip-resistance, Fusion has exceptional resilience, unmatched “compression set” resistance and incomparable cushioning. 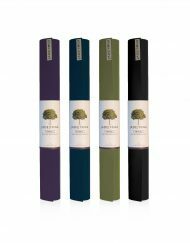 JadeYoga mats are better for you and the environment than any other mat on the market. 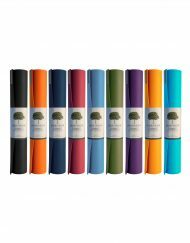 Jade is everything you want in a yoga mat – cool colors, incredible grip, great comfort and eco-friendly. Jade mats are made in a sustainable manner with natural rubber tapped from rubber trees, a renewable resource. Unlike other mats, Jade mats contain no PVC, EVA or other synthetic rubber, and are made in the United States in compliance with all US environmental, labor and consumer protection laws. And, JADE PLANTS A TREE FOR EVERY MAT SOLD – with over 1,000,000 trees planted so far. Our mats come in 4 thicknesses, the 3/16 inch thick Professional mat offering the perfect balance between comfort and stability. 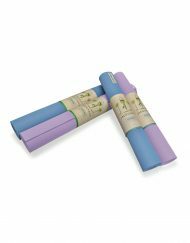 JadeYoga mats are also great for Pilates and other exercise routines. I’m 6’2″ and 195 lbs and the problem I’ve had with other mats is they will stretch out as I extend into certain poses. This, for me, doesn’t lend itself to stability. I purchased this mat because it was the only one I could find that held its shape. Some people may not like the thickness, but I really don’t notice it, much less think about it, when I’m doing raised leg side plank or similar moves. I bought my Fusion from REI after trying and returning the Manduka Pro. This mat is wonderfully thick and comfortable to my joints. I just love the non-slick texture. You WILL NOT slip on this mat! I tried it in Body Flow yesterday and just had to come and write a review on how much I loved it. It fits my mat sling just fine. I know people have complained about the obvious natural rubber scent but it doesn’t bother me and of course will wear off. They also say that it attracts and holds lint easily but that’s not an issue for me either since I’ll be using mine at the gym anyway. All in all, this is a great mat that I highly recommend! One thing though: Jade, can you please make the Fusion wider for the curvier yogis? And send some longer lengths over to REI because a longer, wider Fusion is my preference. Thanks! I have had my Fusion mat now for 3 years and I love it! 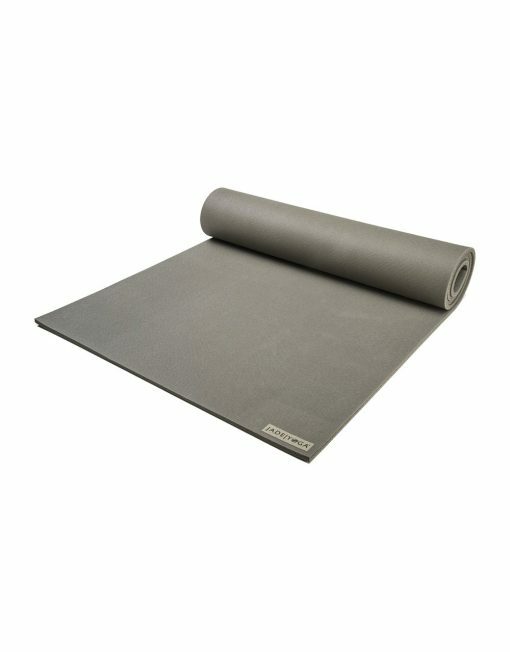 I am a Yoga Instructor and use this mat at least 10-15 hours a week and it still shows just a little bit of wear. Over the past 25 years of my yoga practice I have bought a few thick/expensive yoga mats and this mat is worth every penny! I plan to by a harmony mat too so I can carry it to my yoga classes that I teach away from the yoga studio… I hope I love it as much as the Fusion. (the fusion is just to heavy to carry around all the time for my neck and shoulders with all of the other things I carry to the classes I teach). Everyone should own a Jade Fusion yoga mat. I recommend this mat to my students and I have had 3 students buy one so far and 3 more are planning on buying one! I bought my first Jade fusion mat a few years ago. I never needed a mat towel for it, even in the sweatiest of hot, power yoga classes. I use it 5-7 days a week. The mat is still in great shape more than 2 years later! I have been so impressed. I have never found another yoga mat where I wasn’t slipping and sliding. Great, fabulous product. It just occurred to me that I have had my green jade mat for almost 10 years , I love it, but I probably should now get another as it’s looking a little worn. However I have always wanted 2 mats. One settled at home and the other I take to the studio. I just have to wait until payday but I will get one soon. This mat is excellent at giving stable and substantial support. With this mat I no longer need a rug under my knees, and am comfortable throughout class. At 6’1″, I ordered the 74″ version and I’m glad I did. There is a slight smell of natural rubber, but it is not objectionable at all, it just smells new. This mat seems fairly expensive in comparison to all the options out there. However it is definitely worth each penny. I’ve had this mat for 3 years now and it is still in extremely good conditions. As mentioned by other reviewers, the grip on this mat is fantastic. I always slipped on other mats but not on this one. This mat is fairly thick, but this is what I was looking for since I have sensitive knees. This mat definitely met all my requirements and I am planning to buy another one for my husband. 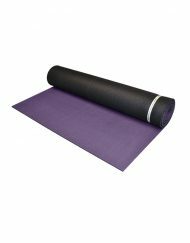 In my first year of practicing yoga I went through a few expensive mats (Manduka, etc.) searching for the right fit and this one is by far the best! My favorite thing is the grippy-ness of its surface. 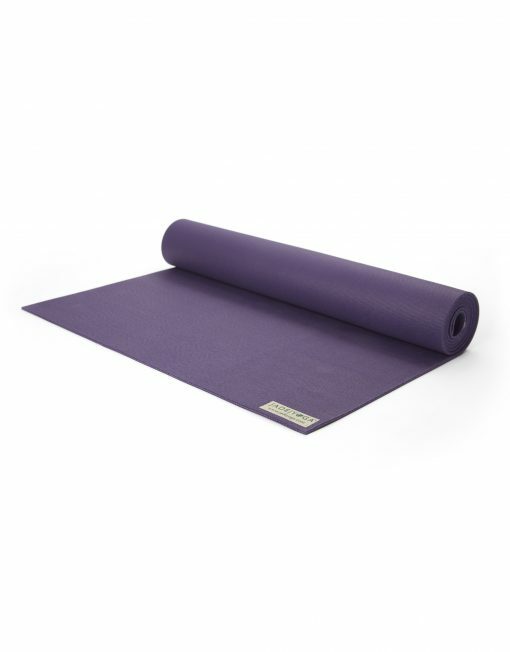 This is the only one I’ve tried that I didn’t slip around on and it has good cushioning but is very stable for balancing as well as not being too heavy to cart around (I’m talkin’ to you Manduka Pro! LOL!). Lots of friends have asked me about my pretty purple mat in classes and are amazed at the nice grip it has, so I’ve recommended it to many as a result. Thanks Jade!! I’ve been using the Fusion mat for a year now and can safely say that this is easily the best mat on the market. I’ve tried multiple mats from Manduka, Gaiam, and Lululemon and the others don’t even compare. It’s super grippy because of the natural rubber and unlike other materials, there is no awful smell. I can transition between poses and feel confident that I won’t slip, even when I’m sweaty. I also love the thickness because I have sensitive knees, and I can comfortably kneel on this mat with no pain. The jade mat is very grippy. It makes it comfortable to practice yoga without slipping. The thickness is perfect. Not to thick or thin. I would recommend getting the 74′ mat. I got the 68′ and it isn’t quite as long as I’d hope. The downfall of this mat is that it does not come with a carrying strap. All the other mats I have ever received have come with a carrying strap for the mat. The mat does not smell like rubber that much. I can hardly notice it. The color was exactly how it was pictured. Although, if you have pets do not let the mat around them. I opened the box and immediately my dogs hair was attracted to the mat and it was COVERED in hair. I could remove it with some tape but it is a downfall that the hair sticks so well to the mat. So animal owners beware. Overall, love the style jusy recommend larger size and carrying strap. I’ve been using the Fusion 74″ mat since early 2014. As advertised, it is very comfortable with excellent cushioning, grip and durability so far. The extra thickness noticeably reduces pressure on joints. The only drawbacks are the bulk and weight–it really is a bit of a chore to transport–and the dark blue color requires more frequent cleaning than light colored mats. It was expensive but I suspect it will last for many years. i am very satisfied with this mat. Prior to learning yoga I had six knee surgeries including having a kneecap and five painful neuromas removed. I have tried lots of yoga mats and had to add a knee pad for all of them until I used the Jade mat. I can kneel on this mat with no pain. Recently I walked into a yoga studio to take a training. There were Jade mats on the floor. I knew I would be in good hands. The Jade Fusion mats are the best out there. 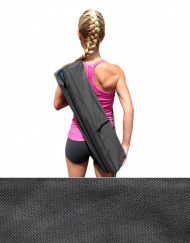 They are long lasting, great cushioning/support for knees, wrists, overall body… I teach yoga several times a week and love my Fusion mat! This is a wonderful yoga mat…. The padding is great for my knees, and the rubber is great to minimize slipping on your mat even when you get sweaty…. I had a problem with getting a slip-proof mat because my hands get pretty sweaty, but this mat is the only mat I found where the sweat drips through and does not stay on top of the mat. I love this mat so much, that I am purchasing a second mat for home use…. One for studio use (which sometimes gets icky) and one clean one for home use. It is totally worth the investment if you do a lot of yoga…. This mat is worth its price! The transaction and delivery were quick and efficient. It makes me happy to know that it’s made out of natural rubber so that I don’t have to worry about endangering my health. The mat is thick and I don’t have to worry about being uncomfortable while practicing yoga. It has a rubber smell, but I am hoping that it will dissipate with time. I have been searching for the perfect yoga mat and i have finally found it!!! After months of trying to figure out which brand,thickness, color, to buy i went with the Jade.. Wow!!! It really helps you stick your posses and you feel so much more secure when you are not sliding and trying to keep your hands and feet in one place.. Don’t be afraid to buy it, it will really make a difference in your practice… Yes it is expensive but it is really worth it…S. 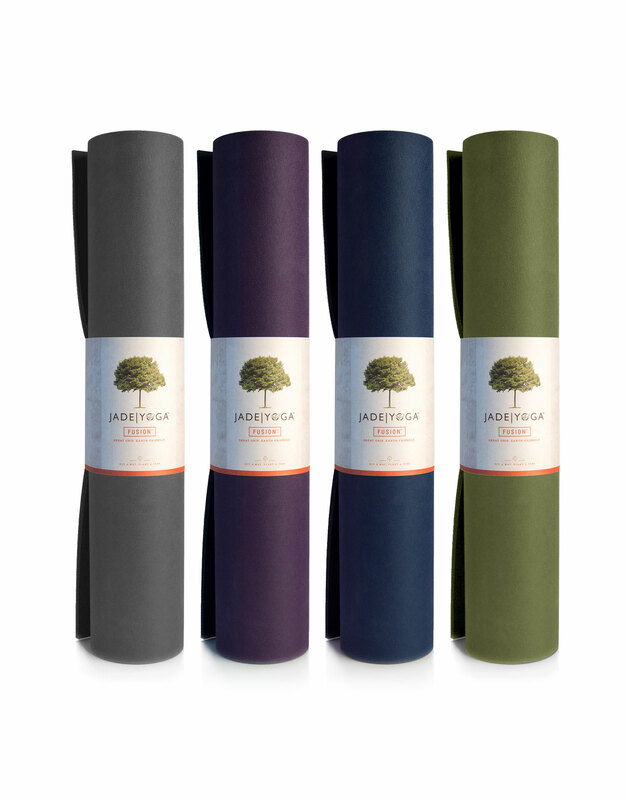 JadeYoga is committed to making the world's best performing, most environmentally friendly yoga mats, providing the highest level of customer service and giving back to the earth with every product made. Exclusive Canadian Importer and Distributor of JadeYoga™ products. Copyright © 2019 JadeYoga. All Rights Reserved.